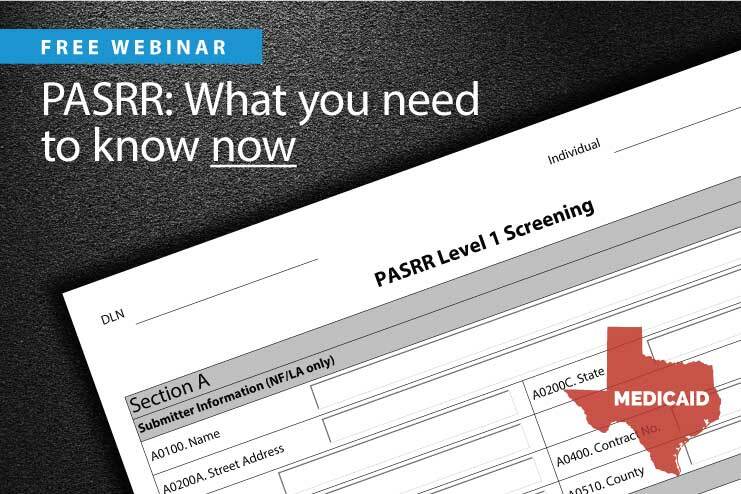 In this highly informative webinar, DADS highlights the most recent and upcoming enhancements to the PASRR program. Learn how to respond to common PASRR issues and concerns faced by nursing facilities, and become familiar with the latest PASRR requirements. Our special guest speaker is Cathy Belliveau, CCM, Senior PASRR Program Specialist with the Texas Department of Aging and Disability Services. This webinar is presented free of charge to Texas long-term care providers, courtesy of SimpleLTC and DADS. There is no sales pitch involved. Please share this information with any colleagues who may benefit from the information.